If you have an economical car, you probably know the feeling. Climbing a hill, holding as high a gear (or in an automatic trans car, as small a throttle angle) as possible - and then the air conditioner compressor cuts in. Suddenly, you have to drop back a gear or apply more throttle. And there goes your good fuel economy. Or you’re performing a passing move and you want absolutely every kilowatt the engine can produce. The air con? For the next 30 seconds, you want it off, off, off! Well, both scenarios are now easily catered for. By using an electronic module that constantly monitors your throttle position, the air con compressor can be automatically switched off (or, sometimes even better, stopped coming on!) when you have your foot down past a certain point. During the initial set-up, you can set the throttle angle at which the compressor becomes disabled, and you can also set how much you then need to lift the throttle before the compressor switches back on. 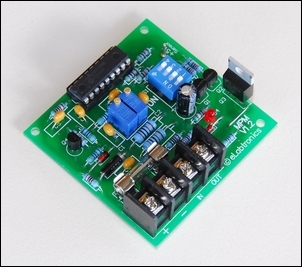 The electronic module is fully pre-built and costs just AUD$59 from the AutoSpeed Shop. 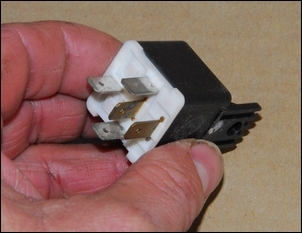 You’ll also need a box to mount it in and a 20 amp ‘changeover’ automotive relay (pictured) that can you buy from your local auto parts shop. The heart of the system is the eLabtronics Voltage Switch. 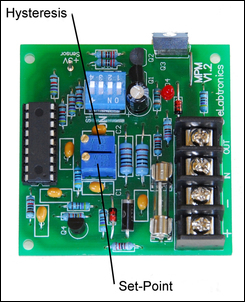 This module, that we first introduced at The eLabtronics Voltage Switch, Part 1, is designed and built by eLabtronics. The module is internally highlysophisticated but has only four external wiring connections. In addition to power and ground connections, there are ‘in’ and ‘out’ connections. In this application, the ‘in’ terminal is connected to the throttle position sensor that is standard fitment on all cars. 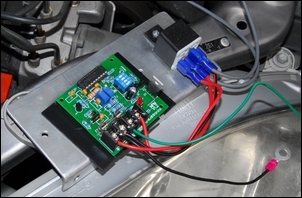 These sensors typically output a voltage that rises from about 0.5V to about 4.5V as the throttle is opened. The Voltage Switch is able to monitor this voltage, at the same time not affecting the standard operation of the car’s engine management or electronic throttle systems. 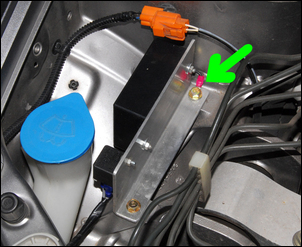 By setting an adjustable pot on the Voltage Switch, the Switch can be made to trip at any throttle position you choose. In this application, you’d probably have it tripping at about one-third throttle – more on set-up in a moment. Now, how does the Voltage Switch turn off the air conditioner compressor? All air conditioner compressors use an electro-magnetic clutch. This means that when power is fed to the clutch, the compressor is able to be driven by the engine. When power is cut off, the compressor drive wheel just spins freely. This compressor clutch power feed is the single wire that you can see going to the front of the compressor. 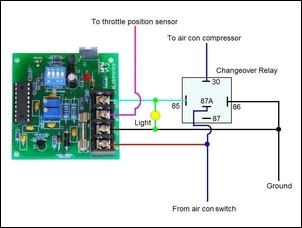 To disable the compressor, all that we need to do is to put a relay (an electromagnetic switch) in this circuit, so that when the Voltage Switch trips, the power feed to the compressor clutch is turned off. Before installing the Auto Air Conditioner Controller, you need to have at least a basic familiarity with car electrical systems. (If you don’t have that, an auto electrician could install the module in about 2 hours of work.) You should have a multimeter and a soldering iron and/or crimper and crimp terminals. If you have a multimeter, you don’t need to have a workshop manual for your car. 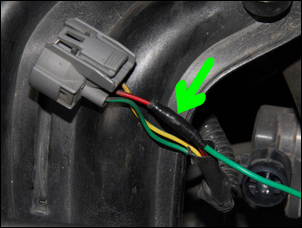 Once you have identified the throttle position sensor, use a multimeter to back-probe the wires (with the connector still in plugged in). Connect the black lead of the multimeter to the negative terminal of the battery (or the chassis) and use the other lead to back-probe the connector. 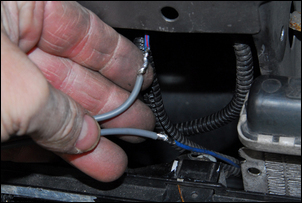 With the ignition switched on, one wire should have a voltage signal that rises with increasing throttle movement. This is the sensor output that will be connected to the ‘in’ terminal of the Voltage Switch. The next step is to do the actual wiring. Automotive changeover relays (properly called single pole, double throw) have standardised numbers on their terminals, making the wiring straightforward. As can be seen if you follow the wires in this diagram, we use the air con compressor power feed to supply power to the Voltage Switch. Taking this approach makes installation easier – for example, it’s simple to mount the module under the bonnet as no wires then need to be fed through the firewall. Want to know what the relay terminals are? 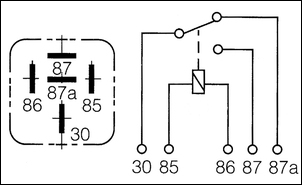 On the relay, terminals 85 and 85 are to the coil. 30 and 87A form the normally closed contacts, meaning that without power applied to the relay’s coil, these contacts are joined together. Therefore, when the Voltage Switch trips and feeds power to the relay coil, the contacts open, breaking the power supply to the air con compressor clutch. We fitted the Auto Air Conditioner Controller to a Honda Insight. 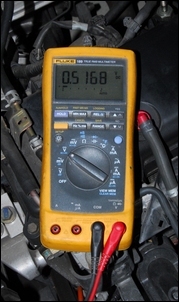 A multimeter was used to back-probe the throttle position sensor until a wire (red/black in the case of the Honda) was found that had the voltage on it that varied with throttle position. This pic shows the ‘throttle released’ voltage. The red/black wire was bared and a new wire (green) was soldered to it. The original wire should not be cut – the new wire just taps into the signal. 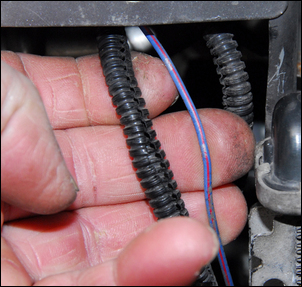 Next the wire to the compressor clutch was located – in the case of the Honda, it is blue/red. The compressor clutch wire was cut and extension wires (grey) were soldered to them before later being insulated with tape. Note that it is important that you mark the wire that comes from the air con on/off switch (or climate control ECU) as this is the one used to feed power to the Voltage Switch. The extension wires from the air con clutch need to be at least as thick in copper diameter as the original wires. The wiring between the relay and the module, and to the compressor clutch and throttle position sensor, were done next. Note the ground lug (arrowed) that was bolted to the chassis when the module was installed. Both the relay and the box housing the module were mounted on folded aluminium plate. There are three steps in setting up the Voltage Switch. The next step is to set the two pots. 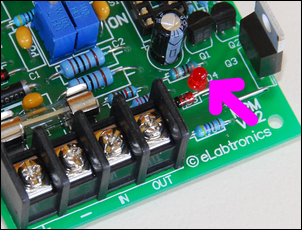 Orientate the board so that the terminal strip is on the right, then look at the bottom pot first. As shown in this pic, this pot adjusts the set-point. Use a small flat-bladed screwdriver to rotate this pot anti-clockwise at least 15 turns, or until it can be heard clicking. (Why so many turns? Multi-turn pots like the ones fitted don’t have clear ‘end stops’, so you need to ensure you’ve turned it anti-clockwise as far as possible.) Then rotate this pot clockwise about 4 full turns. By doing this, you have set the turn-on voltage to a low value. OK, so what about the other pot? This one sets the difference between the turn-on and turn-off values. As with the set-point pot, use a small flat-bladed screwdriver to rotate the bottom pot anti-clockwise at least 15 turns, or until it can be heard clicking. Then also rotate this pot clockwise about 4 full turns. This adjusts the difference between turn on and turn off values (what’s called ‘hysteresis’) to a small value. Both the set-point and hysteresis are increased by rotating their respective pots clockwise. If it is not clear when the Voltage Switch is operating (eg if it’s mounted under the bonnet), temporarily wire a 12V pilot light as shown here and place the light in the cabin. If the module is inside the cabin, the on-board LED will show when the module has tripped. How you set the pots is up to you – but here are some hints. For maximum improvement in fuel economy, adjust the set-point pot to the lowest value that does not trip the switch when accelerating normally (eg away from traffic lights) and when travelling at the open road speed limit. Any lower value than this will cause you to lose the air con when travelling at the country road speed limit, and turn the compressor on and off a lot in urban conditions. For maximum retention of the air con, set the pot so that the Voltage Switch trips only at full throttle – or near full throttle. But what about the other pot – hysteresis? We found that for the best outcome, this should be set to a small value - but not so small that the Voltage Switch chatters on and off. The results of fitting the Auto Air Conditioner Controller to a Honda Insight exceeded our expectations. On the small engine Honda, the ability to hold higher gears up hills and accelerate more easily at small throttle angles was excellent. An unexpected benefit – and probably the thing we noticed the most – was the absence of the air con cutting-in when climbing a long hill. Previously, you’d have the car set to work with a fairly large throttle angle at low-ish revs in a high gear (the best approach for fuel economy) and then part way up the hill, the air con would cut-in and all the balance would be lost. With the Auto Air Conditioner Controller in place, time after time it was like you had a really attentive passenger with their finger hovering over the air con button, ready to turn the air con off at the first sign you could benefit from their doing so. 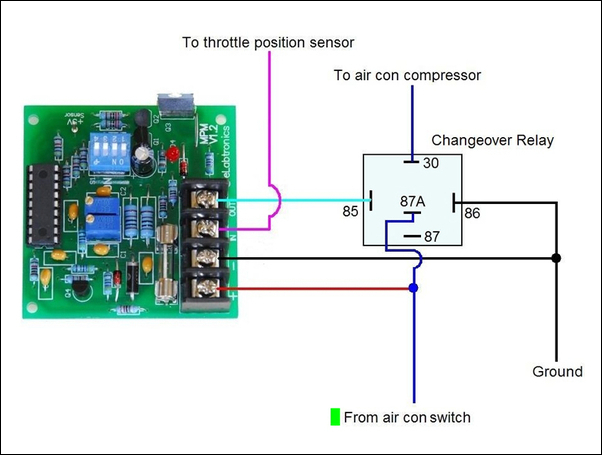 As we’ve indicated in the main part of this story, both power and fuel economy can benefit from fitment of the Auto Air Conditioner Controller. But what about fuel economy? Firstly, as already indicated, the ability to hold a higher gear at lower revs improves fuel economy. But the other affect is probably even more significant. So how does this one work? Air conditioners operate on a thermostat basis – the temperature of the evaporator (or air in the cabin) is monitored, and the air con control system switches off the compressor when the correct temp has been reached. The Auto Air Conditioner Controller puts another switch in after that, one that turns off the compressor at high throttle angles. But if the Voltage Switch says: ‘Nope, the throttle angle is still too high’, the air con compressor will stay off. When the high throttle event is over, the air temp in the cabin will be even higher – so as soon as you lift off the throttle, the compressor will start. Over a drive cycle of hills and valleys, or urban start/stop traffic lights, the air con compressor will therefore run far more often in times of throttle lifts – rolling up to traffic lights, or rolling down hills – than it would without the controller. The result is that you make much more use of the ‘free’ energy that is otherwise expended in braking and coasting. And the result of that is improved fuel economy, achieved with the trade-off of a greater fluctuation in air conditioned cabin temp. There’s no magic involved in the improvements in fuel economy and performance – just a better match to what you, the driver, want from a car. The Auto Air Conditioner Controller is pretty simple to fit, can be adjusted over a very wide range. And best of all, it works brilliantly.